The GPC App is now available in the Amazon Appstore for Amazon Fire tablets. The app is identical to the standard Android app and is used in an identical manner. On Saturday, 23rd June, the first annual meeting of the Friends of Geiriadur Prifysgol Cymru was held at the Drwm in the National Library of Wales, Aberystwyth, and it was a pleasure to welcome so many Friends to Aberystwyth on such a fine day. amusing to hear about the person who, according to a printed report, won a carrot instead of a crown (moron not coron) at the National Eisteddfod – demonstrating how a simple typesetting error can change the whole meaning of an article! This, and other amusing examples recorded by Myrddin, is attributed to the ‘Printer’s Devil’, the creature held responsible by printers everywhere for all such errors. today, describing some of its characteristics. In conclusion, she recited some entertaining verses written in the dialect. biography of Iolo Morganwg, which promises a detailed picture of a fascinating character who contributed greatly to Welsh culture. After the talks, everyone was invited to the Centre for a cup of tea and some cake, along with the opportunity to chat, and for some practical direction on using GPC+. Thanks to everyone for their company – it was a very entertaining and enjoyable afternoon. Andrew Hawke who will introduce GPC +, a new crowdsourcing project to transcribe the Dictionary’s citation slips – see GPC+. The Annual Meeting of the Friends of GPC will be held at 2pm on Saturday, 23 June, at the Drwm, The National Library of Wales, Aberystwyth. 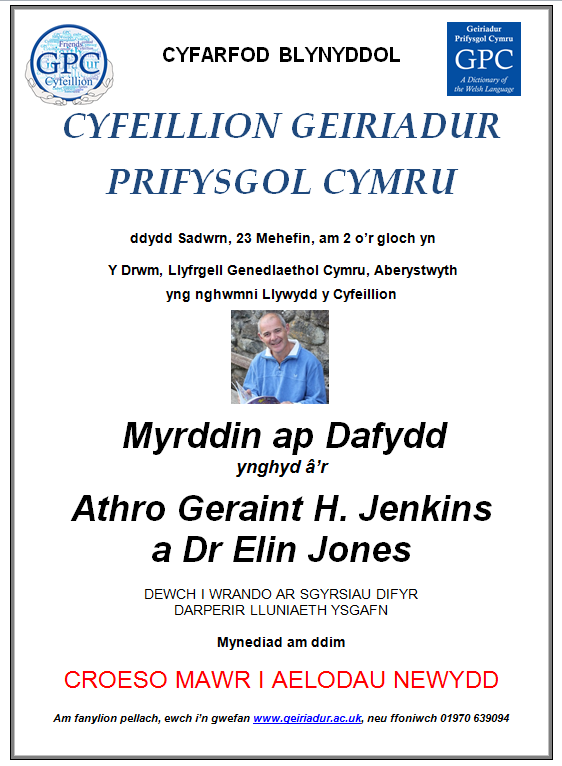 The speakers are the society’s president, Myrddin ap Dafydd, Professor Geraint H. Jenkins, Dr Elin Jones, and the Dictionary’s Managing Editor, Andrew Hawke. We look forward to welcoming Friends old and new to an entertaining afternoon, followed by the opportunity to socialise over a cup of tea. We have just launched a new service called GPC+. This is a pilot scheme to create a valuable new resource that will include quotations that have not yet been published in the Dictionary. It will also include further examples of words which are in the Dictionary. Only about 20% of the examples collected are included in the Dictionary, so it will be possible to discover much more information. But before the resource can be searched it must be created! Most of the examples were originally collected by hundreds of volunteer readers, and now we are looking for volunteers to transcribe the slips so that they are available to all. You can read more about the project and learn how you can get involved here. 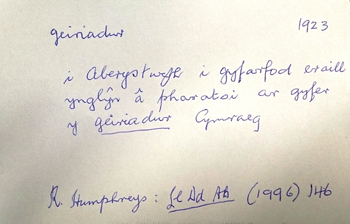 Note: The transcription website is available in Welsh only as we believe that that some of the material would be too challenging for those who cannot read Welsh.